After you have spent time introducing multiplication and its uses you can build on the concept of recognizing equal groups. We can develop the concept of multiplication by recognizing equal groups found in the world. When first introducing equal groups students will count out each item one by one. When this happens it is important to connect the concept of repeated addition and tie that to skip counting. As students get more confident they will start to skip count the equal groups or use other strategies. We work on recognizing equal groups around us. I have a free “Things That Come In Groups” anchor chart pieces download for you so that you can work on brainstorming with your students. Students should be familiar with counting groups before moving on. In my “Beginning Multiplication,” pack students work on using the groups to fill in the sentence frame ____ groups of _____ is _____ and also to write the multiplication equivalent. Next students will learn to see how equal groups are arranged into arrays. 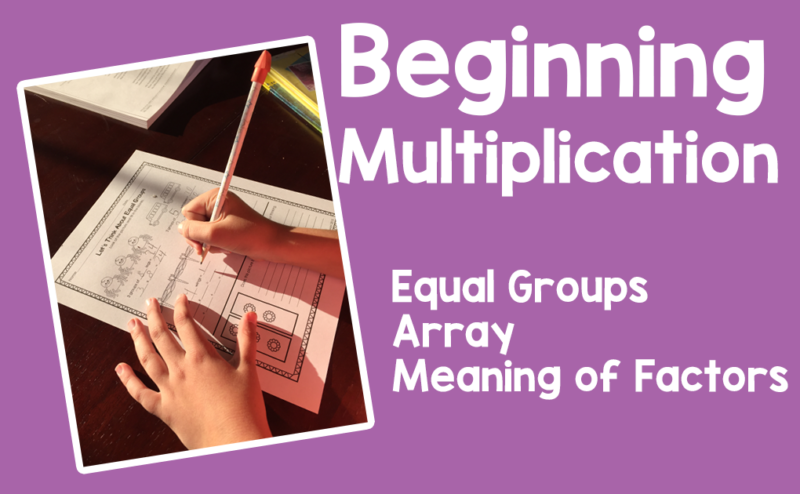 This is an important step because arrays will help students to see groups as one unit instead of separate groups. The array model will allow the student to see how many and also the number and size of groups. If you are in need of proper materials to help implement this stage of multiplication, you can buy this from TpT. The next step will be actually using skip counting strategies to solve a multiplication problem.